One of the cornerstones of Wo’Pop, and what has kept it a unique program is its focus on emerging global music and genres. This focus on the new is important, but you have to have context in order to make sense. Traditional music can be quickly overwhelmed by new ideas and the essence of its origin and being can sometimes be lost. So its also just as important to make sure that traditional music and the artists who make it also have a stage to be experienced. Sometimes those artists are also working hard that a whole culture and even a language are preserved for generations to come. 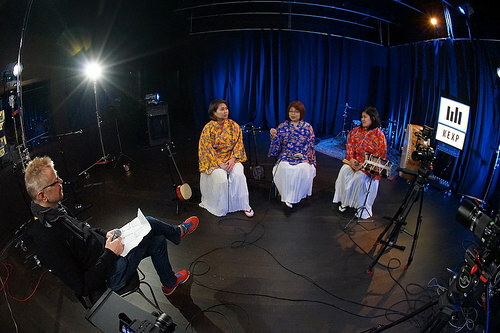 That is the story of the NW based traditional Okinawan ensemble Mako & Munjuru. Originally from the southern most island, Okinawa, in Japan, these artists have chosen to create sublime music on traditional Okinawan instruments of Sanshin, a type of banjo, and Taiko, a traditional drum. Wearing beautifully stitched traditional Okinawan kimonos, these three women sing stories of love, family, and chilling on the tropical beaches of Okinawa. They preserve the Okinawan language, which is considered to be in danger of passing, and inspire and empower young Okinawan’s to explore their culture and community. This is all done while creating captivating, ethereal music. Mako & Munjuru work diligently at their craft, we are better for it. This is their Immigrant Song.